PROUDLY SERVING THE LOS ANGELES AREA SINCE 2013! We are a full-service tire and auto repair shop with full satisfaction guaranteed. Since 2013, Formula Automotive Group has provided car repair services and maintenance for all major makes and models, including, Chevrolet, Audi, BMW, Mercedes, Range Rover, Mini Cooper, Lexus, Fiat, Jaguar, Bentley, Toyota, Acura and more. Our Glendale and Burbank locations have large inventories of affordable tires for any size car or truck. Our goal is to get your vehicle back to you as soon as possible, to let you keep up with your routine. We’re open Monday through Friday 8:00 AM – 6:00 PM, and Saturday 8:00 AM – 5:00 PM. Our highly skilled technicians can often get the work done in just a few hours, but it does depend on what needs to be done to your car. Our locations in the greater Los Angeles area make it convenient for you to bring your vehicle to us for maintenance or full service auto repair. Deals and rebate offers when you purchase tires with us. We service all makes and models and carry the highest quality motor oil for your vehicle. We carry oil brands such as LIQUI MOLY. Having Air Conditioner or Heater Problems? We service all makes and models air conditioners and heaters. We offer car battery replacements for most makes and models, including high end luxury vehicles and trucks. Having a hard time finding a mechanic to service your Hybrid Vehicle? Look no further, the friendly hybrid experts at Formula Automotive Group can service your hybrid no problem. We offer an extensive amount of 4×4 parts. Including stock, aftermarket, performance, and more. Contact us today for details! Formula Automotive Group offers aftermarket lift kits for most Truck makes and models. Contact us today for more details. Not only do we repair stock suspension systems, but we also offer aftermarket suspension systems for most makes and models. This includes lowering springs, full coilover systems, and more. Formula Automotive Group offers performance modifications for cars, trucks, and SUVs. From suspension kits, to tuning software’s, we can bring out the most in your high performance vehicle. Formula Automotive Group offers Intoxalock installation and removal services. Call for details and pricing. We work with nearly all aftermarket warranties for repairs, replacements, and more. Give us a call today for more details. A new car or truck represents a significant investment, and you want to feel good about it before handing over your hard-earned money. Formula Automotive Group’s technicians will inspect the entire vehicle from top to bottom so you know what you’re getting into before committing to your purchase. For a limited time only, we are offering free tire rotation with purchase of an oil change in Glendale, CA and Burbank, CA. We maintain high standards in our shops. Our equipment is extremely advanced, allowing us to perform tasks on the latest and newest makes and models. Our technicians have manufacturer specific tools and equipment for high-end, luxury and exotic vehicles, which lets us take care of your prized possession. Whether you need routine maintenance, full service auto repair or aftermarket vehicle modifications, our team is here to help. We carry the most-trusted brand name tires, MICHELIN®, Goodyear, and Dunlop in our professional glendale and burbank tire shop. Once we replace your tires, you can schedule regular tire maintenance checks with us to keep your vehicle operating at peak performance. Our technicians perform tire rotations and can quickly repair a flat tire. You can fill out this form and get a technician to call you to set up a time to bring your vehicle in. When you make an appointment for service, it saves time because we can get to your car right away. We offer a free estimate, whether you need full service auto repair, restoration or a tire change. Our friendly and highly trained ASE Certified mechanics are here to make sure you are completely satisfied with our service. Ask us any questions you have when you talk to one of our team members. We want to make sure your car gets the care it needs. Formula Automotive Group has the manufacture specific tools and computer equipment for most high end vehicle applications. We'll make sure your vehicle gets the care it needs. We can help make recommendations and installations on all aftermarket vehicle modifications. This includes suspension upgrades, lowering kits, intake systems, wheels, engine tuning, and much more. We pride ourselves on 5 Star Reviews for Excellent Service and Customer Satisfaction. Contact Formula Automotive Group today and experience it for yourself. 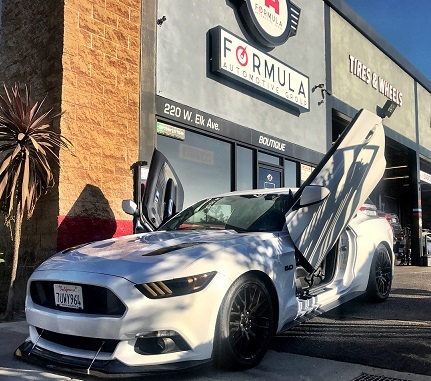 Formula Automotive Group is a premiere auto service and repair shop for Glendale and Burbank, offering everything you need to keep your vehicle running at optimal performance. Our team is backed by more than 20 years of experience – from simple tire repairs and oil changes to brake work and transmission flushes, our ASE certified technicians ensure your car runs like a champ. Count on us for guaranteed low service prices on any make or model of vehicle, and we won’t try to upsell services you don’t need. We are honest mechanics using state-of-the-art laser computer alignment machines. Computer diagnostics ensure we find any problem and perform the proper repairs. Neither Formula Automotive Group, formerly F1 Automotive Group, nor this website are or were ever associated in any way with the Formula 1 Group of companies. F1, Formula One, Formula 1, FIA Formula One World Championship, Grand Prix, and related marks are trademarks over Formula licensing B.V. Stop in your nearest location and check out our showroom with a huge display of wheels and rims in addition to our logo hats and t-shirts. Tire brands we carry include Goodyear, Dunlop, Bridgestone, Dunlop, Kelly, Toyo, and more. Drive in or make an appointment for repair and maintenance. We specialize in auto repairs for the following brands of vehicles: Ford, Honda, Chevrolet, Audi, BMW, Mercedes, Nissan, Infiniti, Lexus, Mini, Bentley, Jaguar, Land Rover, Chrysler, Volvo, Dodge, Saab, Kia, Hyundai, Maserati, Cadillac, Acura, Toyota, Jeep, Subaru, Fiat, and Lincoln.